Boys' Culture Class on Mogmog. 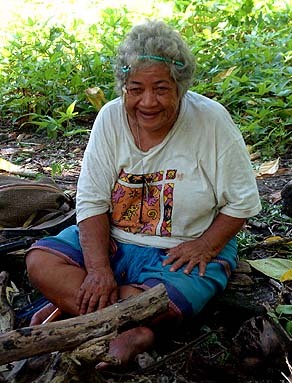 "So, it’s pretty evident, especially here in Ulithi, that with most of the traditional island skills, people still know a little bit. But it’s not like the Woleai area where they still have people that can make canoes. They can sail without using a compass; here we cannot. We have to sail with a compass or GPS, otherwise you’re looking for trouble!" “Same for the making of canoe. Right now there is only one person on this whole atoll that can make canoes. But before, there were a lot of old people that made canoes over here. And this passing down of knowledge from father to son, it’s almost non-existent now. "I think the only knowledge that right now I see the parents trying to pass down to their children is how to behave, like that, to do things so that they will fit in with the other families in the community. But very little teaching of old island skills. Especially the men’s skills. 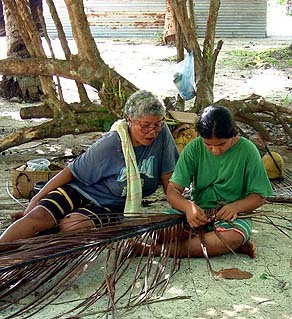 The women, they still know how to weave the lavalava and make the loom. It is a big change." 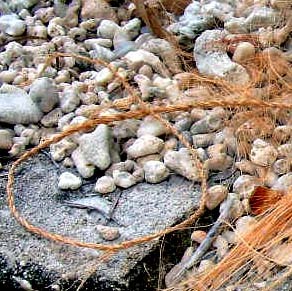 A piece of coconut-fiber string left over from a Culture Class where boys were taught the art of rope-making. 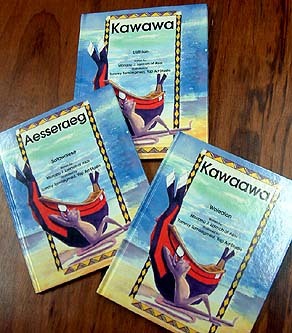 Three versions (Ulithian, Satawalese, and Woleaian) of The Canoe Ride, one of many children's books produced for Outer Island students in their own languages. “I think education should try to maintain the culture. 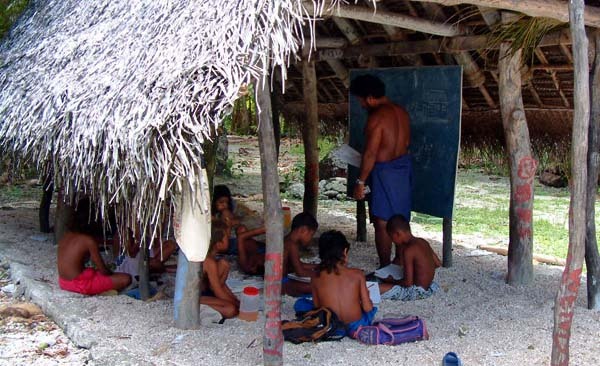 And they should have started back when the Western education got introduced to the island. “One thing that I think it will make the island maintain a major part of it’s culture is the language. We’ll have to maintain that language, and by doing that, we need to have dictionaries, reference grammar and we need to have children’s books that are written in the language, in the new spelling system, because out here, there’s no uniform spelling. Each person has his own or her own spelling system. But we need to have a unified spelling system for the Ulithian language. “We have Culture Class,” says Albert, who teaches at Fedraey Elementary School. “We have a male culture class and a female culture class. 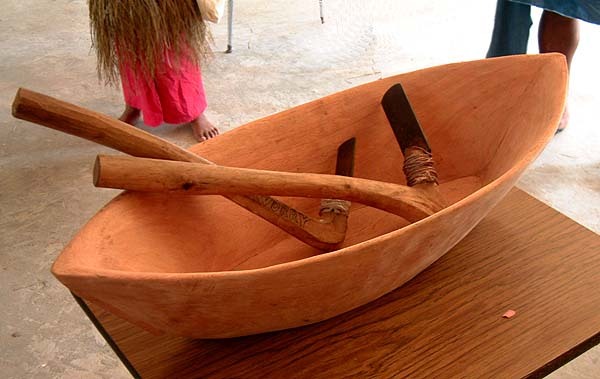 Our male culture teacher’s name is Floren and the woman who teaches culture is Veronica, so in the afternoon on Monday, the boys will go to Floren and he teaches boys the island skills: the customs, the basic things about making the canoe, and the parts of the canoe. But they do not come down to the real things that they have to carve. They just name each part of a canoe. "And the girls, they go to Veronica. She teaches different skills for different grades. 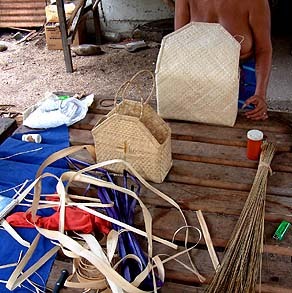 Level one and two, simple weaving of baskets and those local purses, that’s a simple one. But levels five and six, it’s a little bit complicated. Level seven, that’s the one where she teaches them how to weave a big basket." 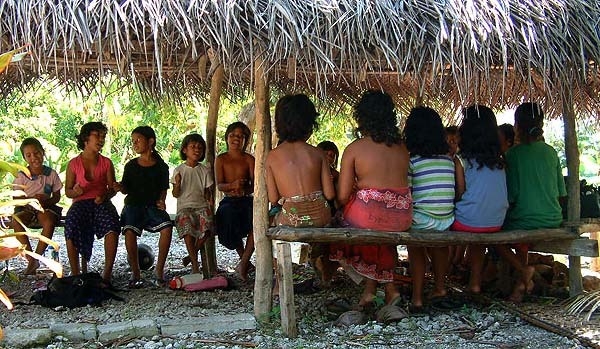 Students practice a traditional song during culture class on Falalop. “When I look at the kids right now compared to those before, I think some of them know the cultural aspects better than students who graduated before them. Because I was a teacher here when there was no Culture class. I taught them History but no culture. History would be American history, also the Micronesian Civics—about the whalers, how they came to Micronesia, things like that. “We meet with our chief and the elders, and the one thing that we’re trying to teach children is the culture, because maybe some day we’re going to ask them about the culture. They know much better about things outside of Micronesia. Like they know about Alaska, they know about Hawai‘i, even the United States. They know much more about these. "But when you ask them about the islands here, some of them say ‘Oh, I don’t know.’ So we’re trying to perpetuate our culture by teaching in all the levels from one up to grade eight. That’s the reason why we still continue to teach the children our culture. Mariano's wife instructs a student in thatching as part of culture class at Falalop Elementary schol. “The Culture curriculum is sort of like a shopping list,” Mariano elaborates. “They have to teach about fishing, they have to teach about things like that, So they can pick whatever is fit to that situation each day. If it’s a good day to teach weaving, then they weave. If it’s a good day to teach carving, then they carve. “Now, outside of the classroom, it’s quite different, because we cannot go and call other people’s sons and daughters. Like in the old days, if I really wanted my son to learn how to carve, then I would pay someone to teach my son. “Nobody’s doing that today. In fact, they’re encouraging their sons to go learn how to operate and repair outboard motors, because that’s what we have. The problem is, if the motor breaks down and the son can not fix it on the way, they end up drifting, and we have to call the ship to go look for them. “So I think it’s important that we encourage these young people nowadays to come learn at home, outside of the classroom. At the school they have to go by their shopping list." “Most of this traditional knowledge has died out because of being kept secret, and people just take their knowledge to the grave. Now, Daniel Dig might know how to carve and complete a canoe. But some of this knot tying, maybe not. So we feel now we should spread this teaching. If there were canoe builders on each of these islands, it would be much better, but we have only Daniel with that interest, and who still has the knowledge. 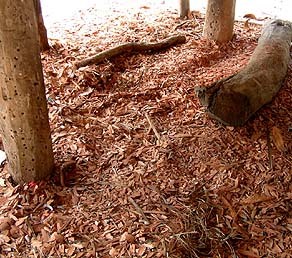 Wood chips from carving line the floor in the boys' Culture Class hut. A pounding bowl made in the Fedraey Culture class, along the the adzes used. “I’d like to make that change to education," Cal says, "like changing the mindset of the students and the children to appreciate and go back to the basics. Not at the expense of neglecting what this future development in the world of technology holds for them, but they have to be presented the best of the both. And they have to make the right decision as to which one they should take. "Not everyone is going to be college material, and not everyone going to move away. Somebody has to stay behind and work the land. And because of those false hopes and wrong intentions we are creating, we are almost half-forcing people to think that they can do whatever they want to do, although they know very well that they do not have the capability and capacity to do such things. "I think they have to understand what they’re capable of doing, and then how can they apply that to the outside factors that will work for them personally, and for the economy." “I remember during my childhood, a family at least had a small paddling canoe. And we didn’t have much, but we’d never run out of food because the canoes served us in many ways. Just even the small ones, we can go out and fish close to the shore. Or we can use a canoe and go to the next island and get some gardening produce, bring it back. "So those were our tools. And it’s fun too. You know, when you’re paddling those canoes with a group of kids, going back and forth. That’s really very enjoyable, and could be a really fun thing to do. “Right now people are more or less dependent on motor boats because it’s easier. But the price of gas is not going down, it’s going up all the time. Maybe sometimes in the way, way future when they find a perfect future, then maybe we can take part in the cash economy, but right now, that’s not feasible." Two small paddling canoes on Asor. 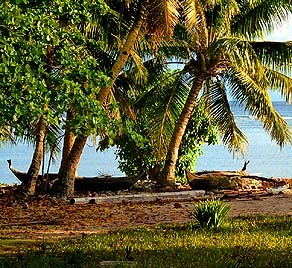 The yellow one, on the right, was built on Woleai. Flomina Yetang, in her sweet potato garden on Asor. “We can never move totally into the cash economy because we just don’t have the means to develop a sustainable cash economy out in Ulithi. We can develop some. Or we can move back to the point where everybody will have to be able to sustain themselves. It’s going to have to be a mixture of sustainable cash economy as well as subsistence. "It’s evident that the land is neglected and not too many people are capitalizing on what we have on the land. They’re not growing crops , or taking care of the land. And there’s other things we tried to create in the school system, to refresh the mindset of these kids so they can view their resources as important. “It’s going to be a long time before we can survive if we are to abandon all our traditional ways of life. Because it is not made to coexist with cash economy. We just don’t have the resources. But now too many people have a lot of false hope. They were taught a belief, or led to believe, that at some point in time life here will be so good that you’ll have all these things. But I think that’s a false hope we create." TheCouncil of the Outer Islands of Yap is a body whose role is to maintain the cultures and customs of the Outer Island peoples. Alphonso sits on the Council, and he explains its aims and methods. 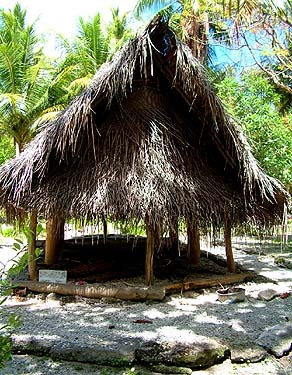 Preservation of culture is also a particular issue with regard to the sacred sites of Ulithi.